Here’s another great David Mann transcription from a Bb Blues that was sent to me from Igor Tomanoski. This is a solo that Dave played on the tune Sun Down. I made a few minor additions and changes to the transcription of some notes and rhythms I heard. This solo is another great example of mixing bluesy emotional playing with modern lines. Big thanks to Igor for letting me post this. Fresh out of the New England Conservatory of Music and new on the New York scene, David launched his solo career in the formative days of contemporary Jazz with the popular “Games” (1987) and “Insight” (1989) on the Island/Antilles label. 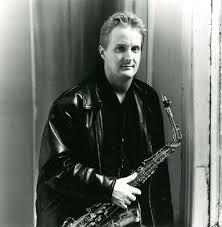 Along with his brother, bassist Ned Mann, came the 1993 release of The Mann Brothers “Mann to Mann” on DMP Records. In 2001, David released “Touch” on N-Coded Music, which showcased his full range of abilities as a composer, producer, programmer, and of course as a saxophonist. Named “one of the best albums of the year” and “debut artist of the year” by Jazztrax, “Touch” finds David in fine company, teaming up with Bob James, Chris Botti, Chuck Loeb and Chieli Minuchi. Along with working on his own albums, David has become an increasingly accomplished composer and producer, working with such artists as Wayman Tisdale, Nelson Rangell, Steve Cole, Kim Waters, Point of Grace, and Rachel Z. In 2001 alone, David scored two #1 NAC singles (with Wayman Tisdale and Steve Cole). David has performed and recorded with many of the biggest names in music, including Tower of Power (1993-1996), James Taylor, Paul Simon, Michael Jackson, Gil Evans, Pat Metheny, Sting, Madonna, Chaka Khan, George Michael, Billy Joel, Lyle Lovett, Bob James, Linda Eder, Liza Minnelli, Patti Austin, Ivan Lins, Michael McDonald, Alicia Keys, Vanessa Williams, Bette Midler, Michael Bolton, Chieli Minucci, Luther Vandross, BB King, Phish, Spyro Gyra, Sergio Mendes, Bobby McFerrin, Leni Stern, Elements, Miles Evans Orchestra, Ricky Martin, Chuck Loeb, Special EFX, Donnie and Marie Osmond, Al Jarraeu, Rob Mathes, Club 1600, Whitney Houston and George Russell. He also can be heard on many TV themes and jingles, including those for Monday Night Football, ABC News Nightline, NBA on TBS, The Early Show with Bryant Gumbel, Later Today, 20/20, 48 Hours and Super Bowl XXIV on ABC. Movie credits include “Lucky Numbers,” “Any Given Sunday,” “Shaft 2,” “The Mask” and “Scrooged.” David has performed as a soloist with the Boston Pops and the National Symphony and has toured extensively throughout the world.